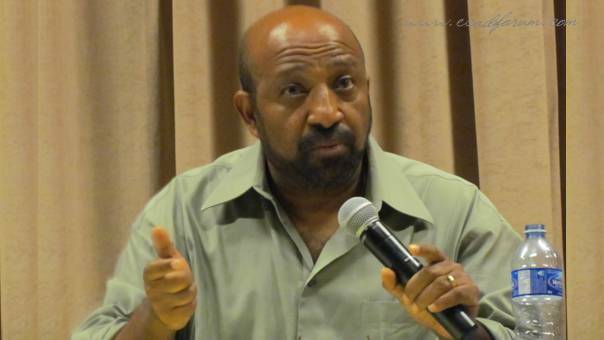 Chairman of the Patriotic Ginbot 7 Movement for Unit and Democracy, Prof. Berhanu Nega called on the international community to pressure the Ethiopian government to agree on the formation of an all-inclusive transitional government before things go out of control in Ethiopia. Prof. Berhanu, who is in Brussels, Belgium to give his testimony at the European Parliament pointed out that the drought in Ethiopia is creating famine due to mal-governance and poor policy choices. He said drought does not necessarily leads to famine in the rest of the world; and the corrupt and autocratic regime in Ethiopia is responsible for the famine that's looming large in Ethiopia. He told the gathering that the Ethiopian government is busy building multimillion dollar mansions for retired officials and spending 15 million dollars for a lavish party at a time when over 15 million people, who are faced with the grim realities of famine, need immediate food assistance. Prof. Berhanu said the regime that's solely controlled by oligarchs who hail from a minority ethnic group is controlling all facets of the government, the economy and even the religious institutions in the country. He cited the imprisonment of religious leaders of the Ethiopian Muslims and the exile of patriarchs of the Ethiopian Orthodox Church as results of the regimes long hands in controlling all aspects of the lives of the people. The Professor also said it was a huge policy mistake on the part of the international community to finance the Ethiopian government in the name of peace keeping in the horn of Africa and in the region when the regime itself was the cause of all conflicts in the region. He said Ethiopians, more than ever, have organized themselves to launch an armed struggle against the minority regime to regain their freedom and build a democratic Ethiopia.